Since its inception in 1924, the park has defined and shaped Southside Place. An integral part of the park’s history was the Seagrave fire truck which, for 42 years, served as a beloved landmark at the park entrance. Countless children climbed on, under and through the revered vehicle and over the years, the park affectionately became known as “Fire Truck Park.” The fire truck was retired from park service in 2012. 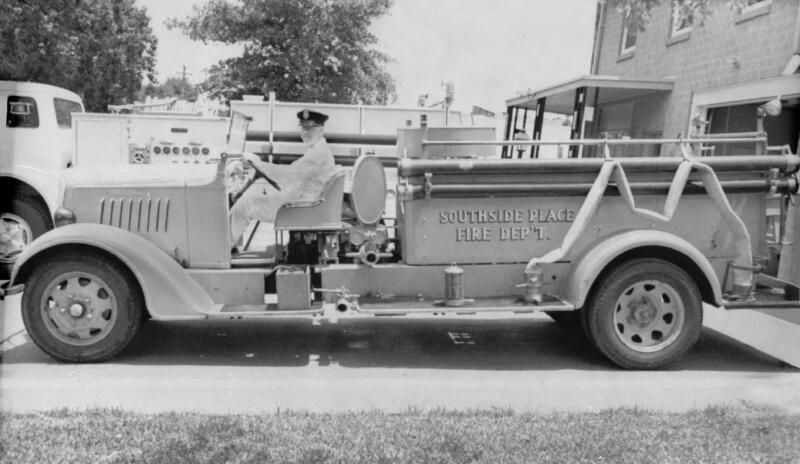 Before it became the namesake of the park in 1970, however, the fire truck served Southside Place for 35 years. Its arrival on December 30, 1935, capped an effort by citizens to fund a water system, build a city waterworks, and from the Southside Place Volunteer Fire Department. The community undertook these efforts in response to the devastating loss of two homes to fire in 1931. The historical accounts relay that B.J. Clark was awakened in the middle of the night by the sound of a dog barking. The stray dog, nicknamed “Happy,” had been taken in by the Clark family just a week earlier. When Mr. Clark got up to investigate, he saw his elderly neighbor’s home on fire. Mr. Clark ran next door and awakened James and Carrie Lyon who escaped the fire without injury. Because the newly-incorporated community of Southside Place had no fire hydrants and no fire department, the West University Place Volunteer Fire Department and the City of Houston’s Fire Department responded to the blaze. After the two pumper trucks were sent to battle the fire ran out of water, the firefighters laid 1,100 feet of hose through neighborhood yards to draft water from the swimming pool in a last-ditch effort to extinguish the fire. Despite these efforts, the homes at 3755 and 3759 Darcus Street were lost. While the citizens of Southside Place were sobered by the loss of their neighbor’s homes, out of that loss, decades ago, a tight-knit community took shape. The essence of that community was, and remains, its proud tradition of service and caring for neighbors.